Celebrating my first half marathon today, plus sharing lessons I learned from my training and race about why weight goals are the actual worst. I promise, it's related! The race itself was a blast, although I was really anxious for two days before it. It didn't help that I got lost in a black hole of googling awful things that can happen during a half (do yourself a favor and DO NOT google image runners trots). Thank goodness for the guy standing next to me in the pen before the race, who was dancing to himself to pump up, but looked so ridiculous I couldn't help but let go of my fears. The run through Atlanta was gorgeous, and a fun way to explore the city I grew up in. I loved seeing places I recognized, because in a sense, Atlanta is home, but it's changed so much it's a new city to me! The course gave us views of the skyline and went through some of Atlanta's prettiest historic neighborhoods and parks. If anyone is feeling particularly generous and would like to buy me a fully restored craftsman off Edgewood, I would not hate you for it. Most importantly though, I felt REALLY good. My main goal was to be able to enjoy the race, so I ran at a comfortable pace until mile 10, then really pushed myself hard for the last three. The entire time I felt so strong, and at no point was I miserable (except for the 3 1/2 hours in the car driving back home...ouch!). So I'm calling it a success! I said I was one and done, but now I'm working on convincing Scott we need to sign up for half marathons when we travel because it was such a fun way to see the city! Anyhoo, on to today's post, which is all about how two experiences I had during my half marathon and training reinforced the fact that weight based goals are kind of the worst. When I first signed up for a half, my main goal was simple: don't die. If I managed not to die, I just wanted to have fun. I really didn't care if I had to walk or if I was the last person to cross the finish line, I just wanted to finish and have a little fun while at it. So when I started training, I did so with that in mind. Because I didn't have a time goal, I didn't invest in any fancy training watches to track my pace. I just trained myself to run at a pace that felt good to me. Of course, some runs were easier than others, and there were times I had to stop and walk, but mostly, I felt pretty confident. On my first 10 mile run, I blew it out of the water. I felt great the entire time, and when I glanced at the clock, I realized my pace was somewhere in the 9 minute mile range. I had previously estimated my pace to be somewhere around 11 minutes, so I was pretty pumped! Suddenly, my goal of 'not dying' and 'just having fun' was gone. Now my goal was to be able to run the whole thing without stopping and secretly, I hoped to finish in less than 2 hours. You can see where this is going. The next couple weeks were filled with setbacks. The next week when I set out for my second 10 mile run, it was awful. I'm not sure why, but I struggled through the entire thing and ended up walking a huge chunk of it. From there, I missed a bunch of training runs with a full work load, travel, and an icky cold that sidelined me for a few days. When I set out for my last long run of training, I felt totally defeated and that feeling was showing up in my running - I felt awful. But as I ran, I realized that I wasn't upset because I was now afraid of actually dying or that I would be miserable the whole time, but because I was afraid my new goals may not be achievable (if they ever had been). Yet, my initial goals of just running the race and having fun were still well within bounds. I mean, if I was feeling miserable, I could always just stop a walk. I had no shame in doing that in the beginning, so why couldn't I be content with my initial goals? As I realized this, I got my pep back and began to feel that same sense of strength I had in the beginning. As I ran, I thought about my experience and how it parallels what happens when I see people get caught up in the scale. Have you ever made changes to your eating habits or lifestyle in hopes of getting healthy, or feeling better, but secretly (or not so secretly!) you have hopes of weight loss? Then when you make those changes, feel great and lose a little weight (which often happens when you eat a little healthier), the adrenaline rush hooks you. Then all of a sudden, you're on a full blown diet. That initial goal of feeling great is gone - now you will be skinny! But pretty soon, when life and/or biology kicks in, the diet won't be easy anymore and those pounds will stop dropping, or may even sneak back up. So, you give up entirely, and go back to your old eating habits, because in your mind, you are a failure. But what happened to that original goal of just feeling awesome? 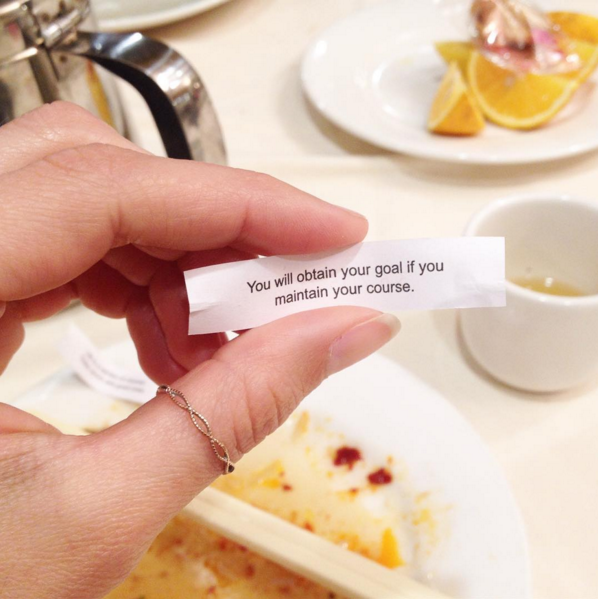 Weren't you succeeding in that before the weight goals came in? Fortune cookie from my pre-race meal was perfect. Too bad it was my husbands, not mine. During the race, I got another reminder of how numerical goals can go wrong. Going in, I really didn't know what my pace was, and really didn't care - I would just run at a pace that felt comfortable to me. That was great and all, until I saw the 2:15 pacer running right in front of me. At first I thought "Heck yeah! I'm running at her pace and I still feel pretty good!" But after a few miles of running in her general vicinity, 2:15 became no longer good enough. I wanted to go faster, and more importantly, I felt like I could go faster, but I had a voice inside my head saying "Don't burn yourself out too early." Just as loud was the voice telling me 2:15 wasn't good enough. Agh!! My head was going crazy trying decide what to do based on this one single number that may not have even been accurate instead of doing what I had trained myself to do - to listen to my body. That's the scale for ya. It's a distraction from the internal cues that really do guide you to the best decisions for your health and wellbeing. It's SO hard to trust your body, but trust me, it knows what's right for you over any external factor, whether it's a scale or diet guru. In the end, I was able to let go and run how I felt, and I was happy, both with my time and my experience. I know that if you are able to let go of the scale, build body confidence and get back in tune with your needs with intuitive eating, you will be happy with your body, and feel great, which to me sounds so much nicer than dieting and obsessing over the scale. Do you agree? I have spots open for my 4 and 8 session packages starting next month. 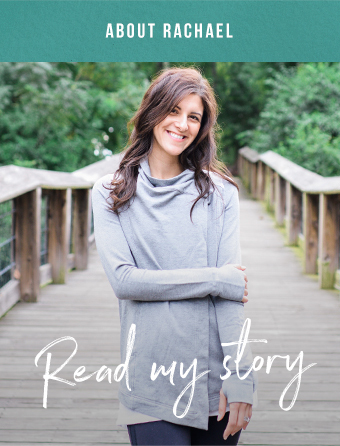 Learn more about my diet-free coaching philosophy and services here, and email me to get started or to set up a free 15 minute phone consult for more information! 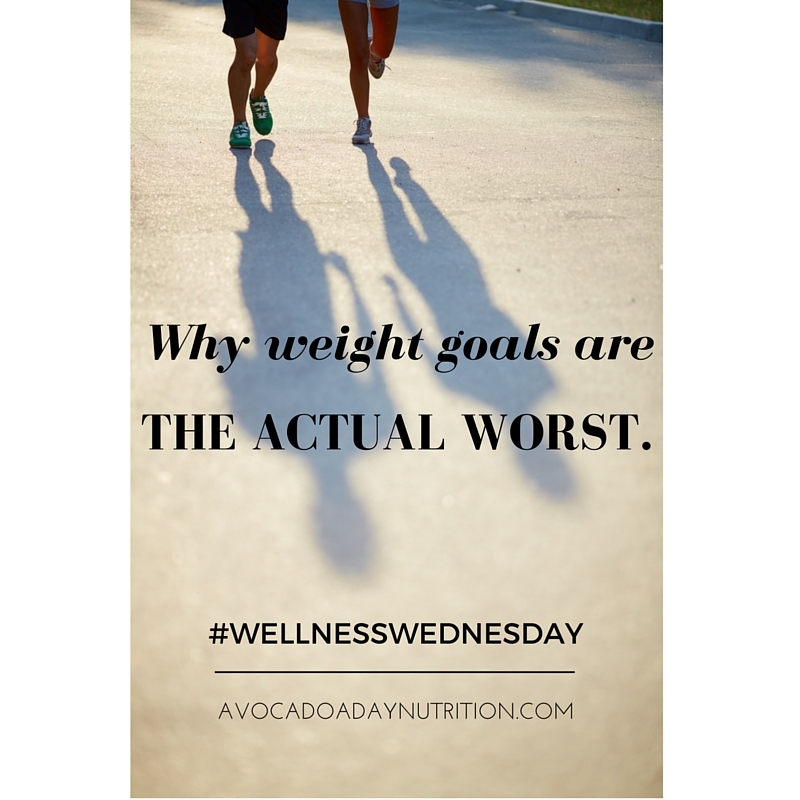 Have you ever had an experience where the scale distracted from what your body really needed?